For the first time ever, a mental health expert has been appointed to the Toronto Police Services Board. 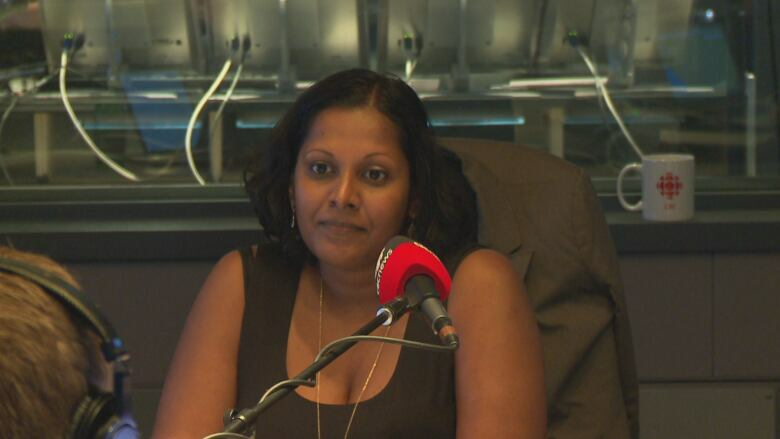 Uppala Chandrasekera is the director of public policy at the Canadian Mental Health Association (CMHA), and was appointed to the board last week. For the first time ever, a mental health expert has been appointed to the Toronto Police Services Board. Uppala Chandrasekera is the director of public policy at the Canadian Mental Health Association (CMHA), and was sworn into the board last week. She spoke with guest host Matt Llewellyn of CBC Radio's Here and Now on Monday. ML: You applied for the position and were one of three people appointed by the province. Why did you want to apply? UC: Through my work at CMHA, I do a lot of work at the intersection of mental health, addictions and the justice system. In that capacity, I work with police on a lot of different levels — in training and in program and policy development. But a fun fact about me: I actually, about 15 years ago, worked as a correctional officer with youth in custody up in Iqaluit(the capital of Nunavut). On my days off, I worked security at the RCMP detachment. That was really my first close encounter with mental health and addictions issues, and I saw the impact on the individuals — the youth — but also on the officers. Back then, there weren't a lot of mental health or psychiatric supports up in the north. So what would happen is: someone's in crisis, they'd call 911, the police would show up, they'd apprehend the person and take them and put them in a holding cell. My job as a security guard was to watch them and make sure they weren't harming themselves. It really showed that the lack of healthcare supports was actually forcing police officers to be the default response. You've heard the term "psychiatrists in blue" — that's where it comes from. Because there's such a huge capacity gap in the healthcare system, we're actually putting police in this situation, and ... they're not health-care professionals. ML: How did you make that transition between working in the north as a security guard with the RCMP to what you're doing now? Was there one particular moment or one instance that made you want to make that switch? UC: I don't know that it was one instance, but I saw the youth... a lot of the reasons why they were in the facility was because they had an addiction issue or a mental health issue and that was rooted in trauma. Over time, I saw the youths get recycled and then graduate to the adult facility. So it really motivated me to be part of the system that provides a compassionate response. ML: What do you want to bring to the force with your new role? UC: I want to really focus on the mental health of community members, but also focus on the mental health of the officers as well. With regards to the police interactions with community members, police are often put in very difficult situations. Police are not clinicians. They don't provide healthcare services. Their job is public safety. So what I want to do is think about how can we work better together — the healthcare system and the justice system and policing — to provide a more effective response. And these aren't issues that are unique to Toronto. This is what happens all over the province, so because I work at a provincial level, I want to be able to bring best practices to Toronto to support the work that's going on. The flip side of the coin is the mental health of the officers. We know issues of operational stress and post-traumatic stress are on the rise, so how are we supporting officers who we, as a society, ask them to put themselves in harm's way every day? How are we supporting their mental health? ML: Is there one of those components that's more important than the other? UC: I would say not. In Ontario, one in five people will experience a mental health issue in a given year, and often one in three within their lifetime. So that's not just for civilians or community members, that also impacts police. I would say they're equally important. ML: Can you give me some specific examples of where you believe Toronto police maybe mishandled a mental health crisis? UC: I can't comment on specific cases that are ongoing, but let me talk about some incidents that have happened in the past. I think we all agree that anytime there's a fatality involving a police officer and a community member, that's a tragedy. We've seen that with Andrew Loku and Sammy Yatim. Following those cases, what we also saw were inquests and a whole slew of recommendations that came forward. The underlying theme across all of them was de-escalation and training. We know that police receive a lot of training. They first go through training at the Ontario Police College, then at Toronto Police College, so you have to think, "What's happening?" So perhaps what's not happening effectively is the implementation on the ground. I would say, again, not unique to Toronto — across the board. And not unique to the sector, either. We see this in health care as well, and we call this "health-care quality improvement." If you're not constantly looking at what went wrong, what could be done better, and are we setting measurements and targets, then how can you possibly improve? ML: In the case of Sammy Yatim, there were 84 recommendations. Why haven't we seen a lot of those changes implemented? UC: I was just appointed to the board last week so I don't know the intricacies of what's been implemented and not, but let me talk more provincially. Inquest recommendations are just that — they're recommendations. They're not mandatory requirements. If something's not made mandatory, that means people can pick and choose what's implemented and to the extent things are implemented. That's the same in policing as it is in health care. So if the province really wants to set standards and ensure all recommendations are mandatory, they have to go that extra length to ensure everything's made mandatory. ML: In the case of Sammy Yatim, would you, as a member of the board, push for a lot of those to be implemented? UC: For sure. A lot of public dollars go into these inquests, so I think we do have an obligation to follow through. But there are lots of other pieces to think about. Is there effective resourcing in place? Is there enough capacity? What's the role of the healthcare system? All of these things we have to think about in order to effectively implement any kind of change.